New York Fashion Week is back for another season and what better way to start off a week of backstage beauty than with a modern version of sixties hair and makeup? The look backstage at Erin Fetherston was so easy, you'll be running to your nearest vanity to try it on yourself. Odile Gilbert for Kerastase created the "Brigitte Bardot-inspired" hair but opted for an edgy twist. Odile calls it “Brigitte on holiday just lounging around her house in St. Tropez.” Models were given loose, textured waves topped off with a cool, zipper headband. Odile then created a side bang and twisted a chunk of hair back to create bangs. She finished the look by tucking the twist into the opening of the zipper headband. Over in makeup, Lyne Desnoyers for MAC made the eyes a focal point of the look. “The idea was a neo-sixties look, but working the eyeliner in a way that it doesn’t look retro,” said Lyne. So instead of the usual sixties winged liner, Lyne chose to create a "square-round" tip while connecting the top lash line to the bottom. “We really worked with each girls eye shape.” She finished the look with some mascara and a touch of highlighter. 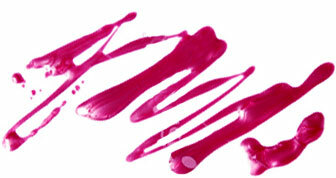 For the lips, Lyne created a custom shade of a pinkish coral and applied it as a stain. “It flirts with the pastels, but it’s a bit richer,” she added. Katie Hughes for butter LONDON polished the nails with two coats of metallic, lilac silver (butter LONDON Lillibet’s Jubilee) for the girls wearing silver shoes, and a metallic gold for the girls wearing gold shoes. “Erin wanted the nails to be a part of the outfit. She wanted them to feel like jewelry,” said Katie.